In 1996, I attended the Urbana Missionary Conference in Urbana, IL. I had graduated from college 6 months earlier, filled with zeal for Christ, a knowledge and love of God’s Word, and an amazing community of Christian friends among whom I had been a leader. The highlight of my Christian training was a month-long leadership “camp” at Cedar Campus in the Upper Peninsula of Michigan, where I spent the month of July immediately following graduation. This month of training was called “SLT” (for “School of Leadership Training“). In the 6 months following SLT, however, things went seriously downhill for me spiritually. The truth is that I didn’t cope particularly well with having moved to Chicago (where I knew only a few people) and lost my Christian community, my church, my ministry, my support structure … and the familiarity of my life in college. I knew how school worked, and although I was successful at my job, I didn’t know how make the single adult life (in relative isolation) work. And there was my problem … trying to make my life work. Almost immediately, I forgot how to leave life in God’s hands. Looking back on it, I wonder if I ever really knew. At Urbana, there was fantastic teaching and worship, and my spiritual life felt revitalized for a while. One of the songs we sang that week was called “Be Magnified”. At the time, I liked it, but it wasn’t deeply significant to me. Other songs that week eclipsed this simple song … meeting me closer to where I was at that particular time in my life. As I left Urbana, I bought the worship CD and listened to it many times, but in the 14 years since then, these songs have become less prevalent on my various “favorite” playlists. It’s true. For almost my entire Christian life, I have made God too small in my eyes. Satan’s lie has and always will be, “Did God really say…” (See Genesis 3:1) God help me, I have acted as if God’s strength was not sufficient … as if He was unable to help me. And I’m the king of leaning not on God’s promises but on the wisdom and judgment and opinions of men (… women … others … you know what I mean). It’s crazy how easily fear has gripped me in my life and driven me toward decisions that have hurt others as well as myself. But the Bible says clearly that God’s kindness leads us to repentance (Romans 2:4) … to turn from our sinful choices and embrace God’s best for us. God loves me, and at that, unconditionally. But the Bible is clear that my love for God cannot be demonstrated in feelings or platitudes or sentimental songs, but rather through obedience. John 14:15 says, “If you love me, you will obey what I command.” That’s pretty straightforward, I think. I’ve spent my whole life being scared of my weaknesses, and even more afraid of what others would think of me if they connected with them like I do (in my own heart). I was sure that I would find rejection if I shared who I really was, but I didn’t … not from people who love me, not from the church, and certainly not from God. Instead, God’s power has been evident to me. Obvious. And I find myself tempted to boast in my weaknesses, because I marvel at the power of God displayed in them. I’m learning … slowly. The part I’m waiting for is for God to heal my heart. He promises to collect my tears (Psalm 56:8) and wipe them from my eyes (Rev 21:4) and a whole host of other sadness-removing, heart-mending, soul-restoring activities. But right now, I don’t feel that. I know others don’t either who have felt the sting of sin, even my sin. So, I guess I’m waiting for God to act. I’m not patient though, you know. I’m not good. I’m not wise. And I’m certainly not strong. Only God is. And I wish I had more faith. But in the meantime, I have just enough faith to stand here and wait. And hopefully enough to amp up my daily time with God, which is so sorely lacking. Sigh. I love the way the author of this song (I have no idea who originally wrote it) asks God to glorify Himself in his life. When I sing this song, I’m saying to God, “heal me … be amazingly powerful … and in my eyes and with my song … be magnified.” That means I want God to be bigger, stronger, more pure, more able. God is already these things. He is unsearchable … indescribable … incomparable. But I have not treated Him that way. This song isn’t so much a statement about God as it is about me. In my eyes, God, be bigger and stronger. Let me see you the way you really are. And in my song. Maybe the author meant that to refer to the music of the song. I don’t know. But I think about it as my life. That’s my song. My choices. Everyday. Who I am. The totality of my life. That’s the song I will have sung when I have breathed my last. And if I want that life to be meaningful … to count the way Jesus meant it to count when He referred to Kingdom living as “life in all its fullness” (John 10:10) … then God has to be very big and very strong and very good in the midst of it. It’s His reality invading mine that makes my life meaningful and secure and right. Nothing else will. So, in my eyes and with my song, be magnified. 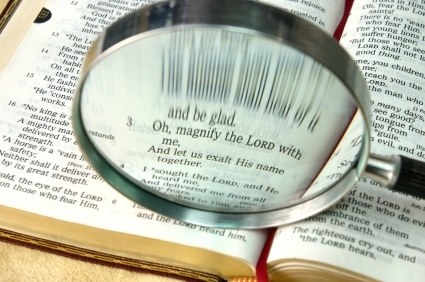 Oh Lord, be magnified! This entry was posted in Psalms, Music and Worship, Theology and tagged God's Faithfulness, God's Love, InterVarsity Christian Fellowship (IVCF), Repentance, Sin / Human Nature, Urbana Missionary Convention. Bookmark the permalink. I really love the paragraph where you wrote about waiting for God. It’s a beautiful expression of your struggle, and it honors God.